What is an arterial & venous ultrasound? 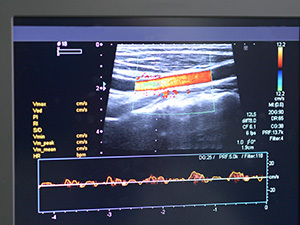 An arterial & venous ultrasound, also known as a vascular ultrasound, is a noninvasive ultrasound method that studies the blood circulation in the arms and legs. What happens during an arterial & venous ultrasound? During an arterial & venous ultrasound, sound waves are transmitted through the tissues of the area being examined. The waves are reflected off blood cells moving within the blood vessels. The physician can then calculate the speed of the waves and display them on a computer screen. What is the purpose of an arterial & venous ultrasound? Patients lie on the bed. A small amount of water-soluble gel is applied to the skin over the area to be examined. Images of the sound waves are displayed on the screen to show the blood flow. This takes about 30 to 45 minutes to complete.